With a well documented history dating back to the original owner and a few cross references with build dates and production records we are able to piece together quite a comprehensive archive on this early convertible. We know that the colour was originally Signal Red and the interior and fittings are as correct as they should be. Commission number Y154469 and Engine Number Y17641HE was built in late July early August 1960 which sounds vague to start, so let’s clarify those dates: Standard Triumph had a two week factory shutdown/holiday the first two weeks in August – it was called the Coventry Fortnight and a large number of factories and component suppliers within the area all took the fortnight off. Complete factories would stop working and shutdown, our car was being built immediately prior to this shutdown, was left for two weeks, partially built, possibly completely built, as it was despatched the first week back – 15th August 1960. It was the 22nd car to be built in August. It was despatched via the main dealer/distributor for Portsmouth, Munn & Underwood for the invoiced price of £672. 11s 6d. Munn and Underwood were located at 89 Palmerstone Road, Southsea, Portsmouth – the car would have arrived there, been checked over and sent on to the appropriate garage (UPDATE HERE). The car was sent to the Isle of Wight – Downing and Donovan in Ryde – the car was a dealer/demonstrator first being in the showroom from at least 25th August, (We have the actual advert) finally being registered 8th December 1960, with a coveted island DL numberplate, VDL634, with a reference to ‘Green‘ on the registration. The car was finally sold to the first ‘owner’ around August 1961 with 12,000 miles on the clock! Is this a photo of the car in the showroom? The first owner was Richard Stimson and his wife Daphne, they lived on the west of the island, in Freshwater in a rather nice house called ‘Sungarth’ on Colwell Road, they had been on the Isle of Wight since the thirties. The house is still there today. Mr Stimson was a keen photographer, never worked and never left the Island which indicates he must have seen the Triumph Herald locally. Mr Stimson bought the car and it stayed with him for the next 28 years! Sadly, both Richard and Daphne have since passed away however I have been in contact with Beryl, a daughter in law who could tell more about the original owners. Daphne, in particular was very proud of the car and was so sad when it was traded in for a ‘Volkswagon!’ Beryl was able to supply a couple of ‘new’ period photographs of the car which were not in the history file upon my purchase. 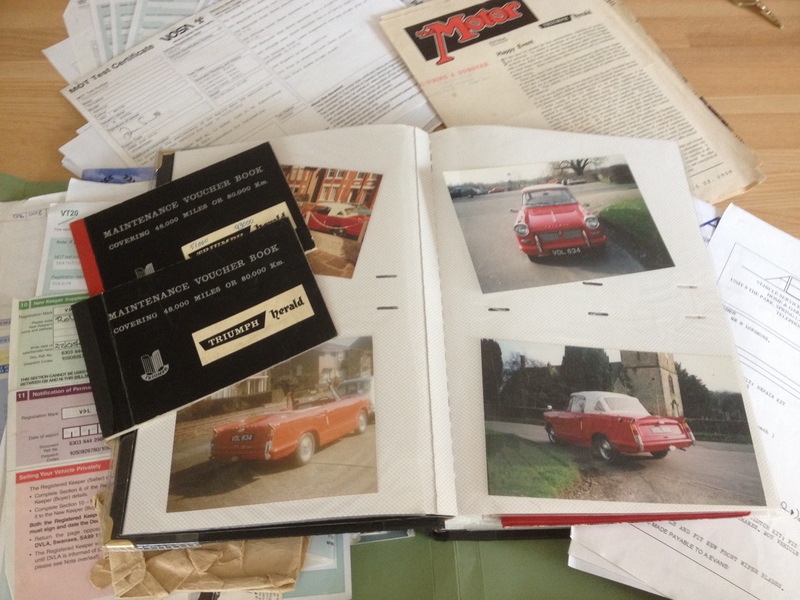 As previously mentioned, the history file contains a wealth of information compiled by Mr Stimson, this includes Service schedules, mileages, receipts, factory correspondence (there is a great Standard Triumph letterheaded sheet with the cars detail on replying to a letter relating to the hood and the fitting of seatbelts). Thanks to Mr Stimsons records it seemed to encourage the next owners to follow suit and we can accurately see how many miles were covered by the car from new to this date, each and every year – quite a feat! The time eventually came for the Stimsons to part with the car and VDL634 was traded in for the Volkswagon (I bet the VW isn’t still around!) 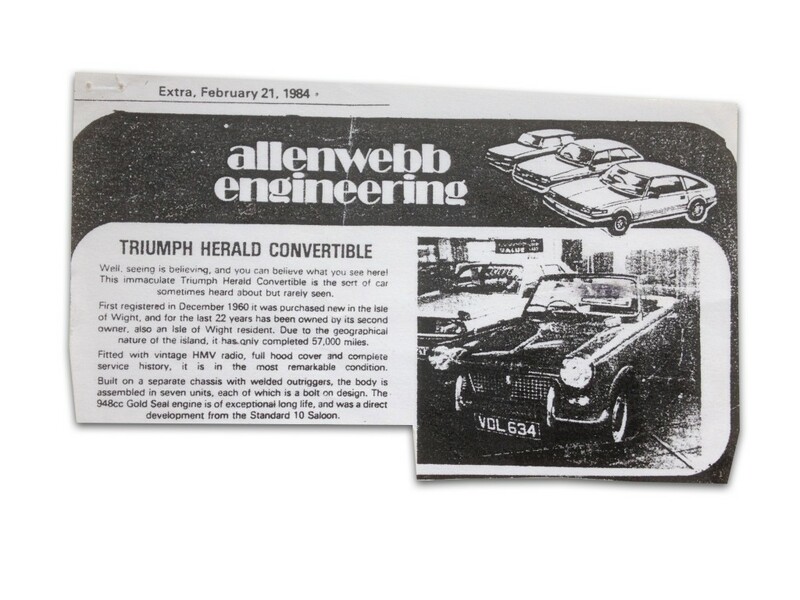 with the period advert saved in the history file describes the car as ‘Well seeing believing and you can believe what you see here – an immaculate Triumph Herald Convertible the sort of car sometimes heard about but rarely seen – Feb 21. 1984′ and it was subsequently given a new home by Marie Smyth, 9 St. Annes Drive in Herne Bay – back on the mainland. Again the ownership of the car was a while with Marie keeping VDL634 for the next thirteen years through to 20th January 2001, after which it gained a new owner, Jackie Feast from Edenbridge in Kent. Jackie Feast along with husband Paul Feast owned the car until 22nd May 2007 during which time it was professionally photographed by Practical Classics magazine and featured both in an article and on the front cover in June 2002. ‘Rosie’ also appeared at the TSSC South England Meet (SEM) at Leatherhead in May 2001 – and won ‘Best in Group’ for the Best Herald. Jackie and Paul Feast sold VDL634 to Robin Longmore in Malvern in 2007, who admitted to ‘not using it much’ and whom subsequently sold it to me in July 2013. The car has been Mot’d and roadworthy continuously since 1960 and remains unrestored and very original. At some point – and we’d love to accurately determine when – the car has had a respray, yet it seems the windscreen was not removed and the new paint was only on the outer sides. The interior and engine bay is untouched, unmodified and lovely, today it is probably the earliest surviving Triumph Herald Convertible in the UK.